The following has been posted by Tran Quang Hung at the CutTheKnotMath facebook page. Reflect a regular pentagon $ABCDE\,$ in each of its sides. 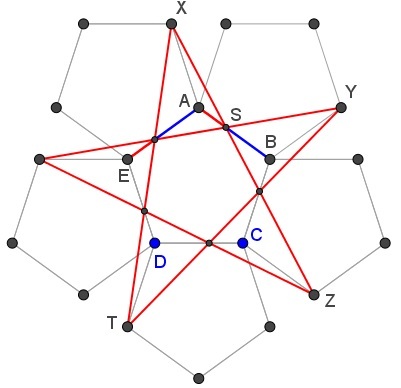 Join the vertices of the so obtained pentagons skipping two at a time. The resulting star cuts the sides of the pentagon $ABCDE\,$ in the Golden Ratio. In particular, there are additional occurences of the Golden Ratio. To discover them, you'll need to two or three boxes checked up.